The Highlight: Nightly harbour boat tour and subsequent visit of the Miniatur Wunderland - Special Offer! Today you get 10% OFF for a late departure. For special events we have no further discounts. - Delivery by post: please select the tickets below..
Nightly harbour boat tour and subsequent visit of the Miniatur Wunderland without waiting times!!! The wharf is only about 200m upstream the River Elbe from the entrance of the Wunderland away! We have specially open today until 01:00 h! - Between 19:30 and 21:00h: Departure for the wonderfull 1h harbour boat trip. 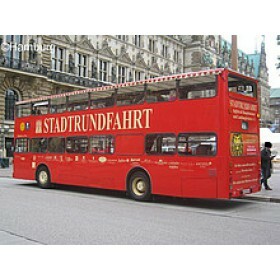 Let enchant yourself by magic nightly atmosphere of the Historic Warehouse District of Hamburg and the subsequent visit of the Miniatur Wunderland without waiting times! Once you arrived at the wonderland, you can refresh yourself and gather your strength with one of our delicious dishes, or enjoy our down-to-earth boats-and-trains special offer: Currywurst (classical curried sausage) with fries and a drink for only 6 Euro! Get insight into the history of the Miniatur Wunderland through our presentation "History of Wunderland" (in German) and take a fascinating look behind the scenes of the America and under the Swiss section! We have different timeslots for the departure of the ships. We have chartered several ships and if one is totally boarded it will start its tour!